It’s almost time for the USA’S match in the round of 16, and we are READY! Since opening, Republic has gotten off to a seriously good start. There’s just a really great, laid back, but really fun atmosphere here, and we’ve found ourselves watching more than one match here so far. It’s wild, but not crazy crowded and intense. We’ll be slipping in to watch the game, (and hopefully celebrating after! ), and having some of their unique cocktails – like the Always Vacationing. Also, Republic is a pizza bar, and there is nothing like midday beers and pizza to get us in sports watching mood. Republic is lounge-y, and less like a sports bar – but that’s a little bit why we like coming here to watch the games! Half the team at Give Me Astoria is really into the whole sports bar vibe, and they’re heading to the Mad Donkey Bar and Grill. Now, the USA playing is the perfect excuse to have fishbowls at 12 in the afternoon. Don’t judge us. 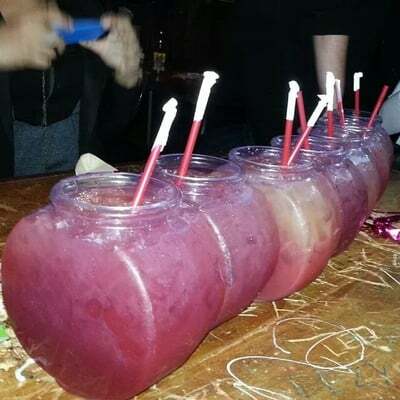 If you haven’t tried them – they’re $30 for these huge fishbowls that are literally filled to the brim with alcohol goodness. So good. Plus, they’ve got that old-school-throw-your-peanuts-on-the-floor things, which isn’t for everyone, but it definitely gives Mad Donkey part of its charm. BUT if you’re slipping out back to work after the game – you might want to soak up the fishbowls and beers with The Donkey Mess, or their Philly Cheese Steak. OR you can just build your own burger! Katch has been wild this entire World Cup. One of the greatest vibes in Astoria, we love that there’s always a big crowd here, but the cover charge isn’t insane – some places have been charging upwards of TWENTY dollars just to watch the game. The backyard area is our favorite spot to catch the game – they’re calling it the Katch Kourtyard, and for their admission price they throw in a beer! Katch has a less rowdy crowd than some of the other sports bars in the neighborhood – and that’s something we really love – a crowd that’s fun and exciting without being too crazy. Definitely the place to go if you’re looking for a laid back vibe! Grand is a great place to enjoy the game, but also enjoy whoever you’re with, and a big, sit down meal. While it’s quieter, don’t expect the patrons to be less excited – Grand is crazy about the World Cup! If anything, it’s the sophisticated choice – so if you’re watching the game but aren’t into being rowdy or on your feet, or even if you’re just in the mood for a great meal, Grand is your spot. Next articleA Taste of France in Astoria!